With Paleo and Whole 30, I can’t do that. We can’t have breads, rice, noodles. Basically all the things that I love. So when we’re trying to be good, we have cauliflower rice. Which I’ve blogged about before, but honestly it’s always a good refresher. Plus, I’ve found a much easier way to make it. What is cauliflower rice, you may ask? It’s cauliflower. Yes, plain old cauliflower diced up, sautéed with garlic and onions and passed off as rice. Because, well… I wanted rice and couldn’t have it. Save some time and buy the frozen cauliflower. You’ll thank me. Also buy a Ninja blender if you can. It’s a miracle worker and one of the best gifts we’ve gotten lately. Purees that cauliflower in an instant and is super easy to clean. Don’t believe me? Try it. Place your frozen cauliflower into your blender and pulsate until it’s become fine. You don’t want large clumps. In a medium skillet, heat olive oil. Add minced garlic and diced onion to the pan and cook on medium heat until onions have softened and started to brown. Add frozen cauliflower to pan and fold it into the onions and garlic. Increase your temperate to medium-high heat. You want to cook out any water from your frozen cauliflower. Continue to cook and stir for 8-10 minutes. If your cauliflower looks watery, increase heat a bit and cook for a few more minutes. I like to let mine brown a bit, so I prefer a higher temperature while cooking. For the main portion of your dish, sauté onions, carrots, and broccoli in large pan with some olive oil for 5 to 8 minutes or until onions and carrots have softened. Remove from pan and set aside. Add chicken to pan and cook on medium-high heat until chicken is no longer pink inside, about 7-8 minutes. Add vegetables back into pan with snow peas. Add Stir Fry sauce and 1/4 cup of water, combine into vegetables and chicken. Add a lid and cook for an additional 5 minutes. Remove lid and cook until sauce has thickened. 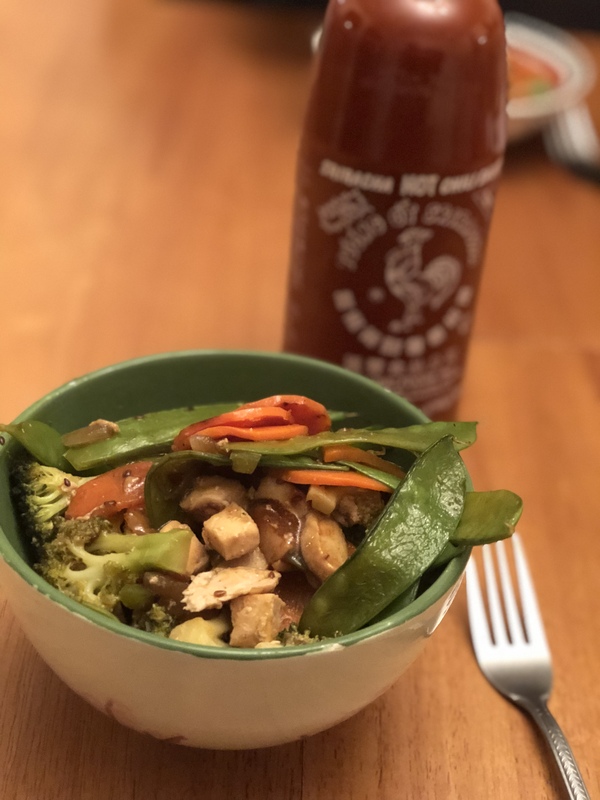 Serve chicken stir fry over cauliflower rice and enjoy.